I have dropped them a message, but I ask you FX Home people to insist on them to fix the issue as soon as possible and send you the fixed version of the plugin, so we can have it working in the upcoming Hitfilm Pro version. Use Title Studio. The other effects like Extruded Text, Type on Text, Extruded EPS, Extruded Spline, Layer deformer are legacy effects. I doubt they have been updated for additional support in some time. Title Studio contains the features of all the classic Boris 3D legacy effects. It contains features beyond those. Title Studio is not as simple to use as the separate effects for very simple text. 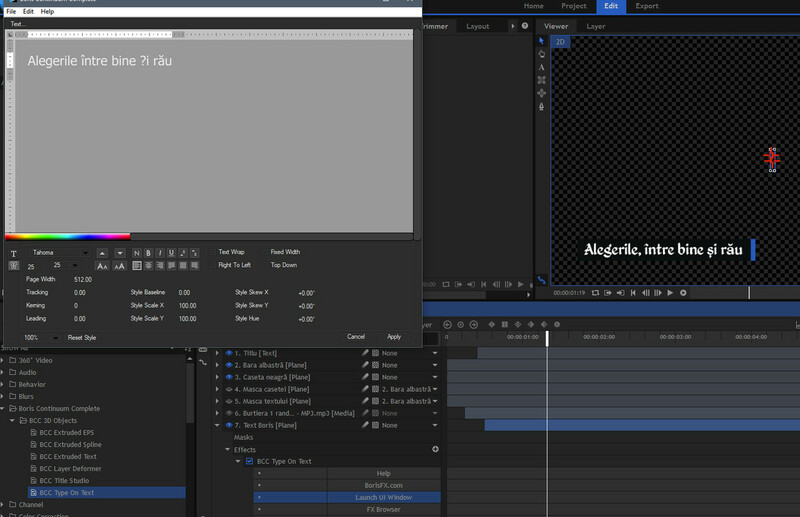 Title studio has it's own user interface to accommodate its feature set. „Unfortunately this is a known issue, but there is a workaround that should work, however. In instances like this, go into another program that will accept all of these characters, like Microsoft Word, write the content of your title inside there, and then Copy-Paste the contents from the Word Processor to the Text Window - this should get the characters to display correctly”. Fortunately, this does work, so I don't have to stick to regular text. However, I emphasized that they should fix this ASAP, so Hitfilm Pro could include it in the upcoming version. I hope they do it fast enough for the FX Home guys to implement it in the next version. @GabrielTudor you missed a very important thing @NormanPCN said. Boris Title Studio is the only one of those plug-ins still under development. The others are out of development and only included for backwards compatibility with old projects. Development on the older plug-ins ended with version 8 in 2011. Current version is 11. Boris isn't going to update those plug-ins again. Chances are they aren't going to fix it in the next couple of weeks, either. Heck, I even think the Hitfilm version of the BCC 3D module is version 10. @Triem23 Title Studio has the same issue. So, Boris has to fix things anyway. They should be ashamed that they released something not suitable for all languages. Ahh, I pasted your special characters into Boris. I copied from a Character map app. Don't have such a keyboard or know the escape codes to enter such chars. A note about Boris "fixing" something. Boris Title Studio has had a problem with Hitfilm since the day it existed (timeline frame rate). Boris has not fixed it to this day. This is a a couple of years. Of course, this may be Hitfilm specific. Unicode text entry would apply to all use cases of Boris. So, don't hold your breath. @GabrielTudor If simple 3D text is what you want, have you considered using HitFilm's own extrusion and/or bevel capabilities for text layers? @jsbarrett No, I didn't consider that, as I bought Pro, so I guess I expected that those plugins are enough to do the job without me having to figure out alternative ways of doing a simple thing. In the end, I managed to get the job done by writing the text in a Unicode editor (like WPS or even WordPad), then pasting it in the Boris editor. It works that way. A big thanks to all of your support! It's so nice to see the Hitfilm community is near when you need help. @GabrielTudor I'm just seeing this but if you need to do this again in the future, you should be able to do it natively in HitFilm, ie with a text layer and not a plane with a BCC effect on it. If you see things that you cannot do natively in HitFilm, please do let us know and we will try to improve things. Unfortunately, what gets fixed in plugins developed by other people is out of our control. We can only ask for an update. Thank you very much, @CedricBonnier! I'm enjoying the latest text enhancements in Hitfilm! There are some goodies here. On a different note: do you owners of Hitfilm Pro get the same icon for the saved files as the software's main icon? I mean, instead of a white document with a colored diamond on it, do you get the blue diamond for every new saved file? Cause that's what I get and wonder if this is something that should be fixed or if it is normal for Hitfilm Pro.